Amazon Great Loot Suggestion List Under Rs.50 Product + Free Shipping or Delivery Trick for All, Amazon Free Shopping of Rs.50 Unlimited Trick – Yesterday we shared Free Rs.50 Amazon Gift Card loot trick (Two different offers), So many user got unlimited coupon of Amazon Rs.50 Gift voucher. You can use these Gift card in new Amazon account only. This is the very small amount of gift card, but still you can buy so many product from Amazon in free of cost using these coupon code. Also you will get Free shipping on all product using the Prime Trick. 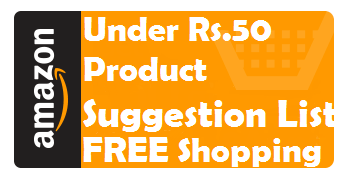 We are sharing Amazon Free Product Suggestions List Under Rs.50 & Free Delivery Trick. So make account of Amazon using fake email and add Amazon gift card in your account. If you already added into your account. Then just buy so many useful product from Amazon in Free of cost. Sign up your new account using any email id. Click on Join Prime for Free. Finally Prime service activated n your account. Choose any product from Below List. Enter Shipping details, Proceed to Payment. Finally you will get Product in Free of Cost from Amazon. NOTe : FREE Meaning, Use Rs.50 Gift Card (Which you got from Xender & 9Apps) or Rs.50 Amazon Gift Balance Amount to Get these Product in Free of Cost. we will add more suggestion, just visit this post. We will add approx 100 deals. how i will get the item for free …if i pay via my debit card thn wht?? Bro recently we shared Free Rs.50 Amazon Gift card loot (9Apps & Xender offer) in which so many user got unlimited coupon of Rs.50. If you use Rs.50 gift card then only you will get it free. Recently we shared Unlimited Rs.50 Amazon gift card loot offer, So all user got so many gift card & they add in new amazon account. So now i gave suggestion of product to buy it using Gift card at free of cost. Hope you understand. Wow! What an amazing tricks here. Thanks for your hard work Shahnawaz Ahmad to accumulate all the great thoughts here in this post.